If you remember Curtis 'Da Bull' Iaukea, Ripper Collins, Gentleman Ed Francis, Handsome Johnny Barend, Neff Maiava, and The Missing Link, you will certainly remember Lord "Tally Ho" Blears. If you remember the early 1960s when Wrestling from the Civic was introduced on Honolulu TV's channel 4, you will certainly remember the formal visage of Lord "Tally Ho" Blears. If you remember the early surf contests at Makaha and on the North Shore of Oahu, you will certainly remember the booming voice of the beach announcer Lord "Tally Ho" Blears. He was a fixture in the surfing, canoeing, and wrestling worlds of Oahu and Hawaii life. Mr. Blears died on March 6, 2016 at the age of 92. It was his wish that his ashes would be scattered at the beach that he loved, Makaha. 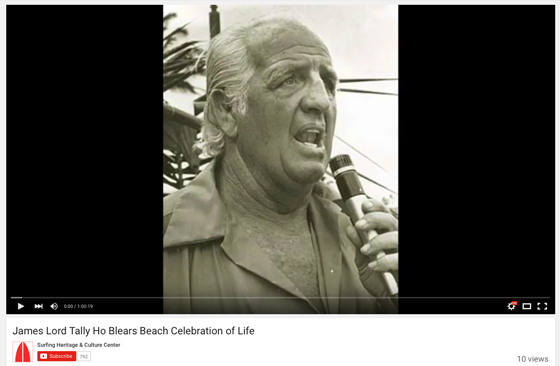 This video is the beach celebration of life for Lord Blears and is dedicated to the children, grandchildren, and great grandchildren of Mr. Blears. Music on this video is courtesy of Michael Leonard and of Laura Blears' classmate Bill Brooks. THANK YOU to Kyle Metcalf for filming this memorial tribute. CLICK HERE to view.